I have another Christmas cooking recipe for you and that is festive cupcakes!! I am just using my basic chocolate cupcake recipe so I'm going to be mainly giving decorating ideas but if you want a recipe on how to make actual cupcakes you can click here. I made two different designs!! One is based on candy canes so everything is white and red. The other is based on santa and christmas trees and they are white, red and green :) Keep reading to find out how to make these!! The first set of wrappers I used for my santa/christmas tree design and they were really inexpensive from Target for about $3! The second set of wrappers I used for my candy cane design and they were purchased here. The candy cane sprinkles are peppermint flavoured and scented, they can be purchased here. The stuff in the red bag is sanding sugar and can be purchased here. The red and green christmas tree sprinkles can be purchased here. 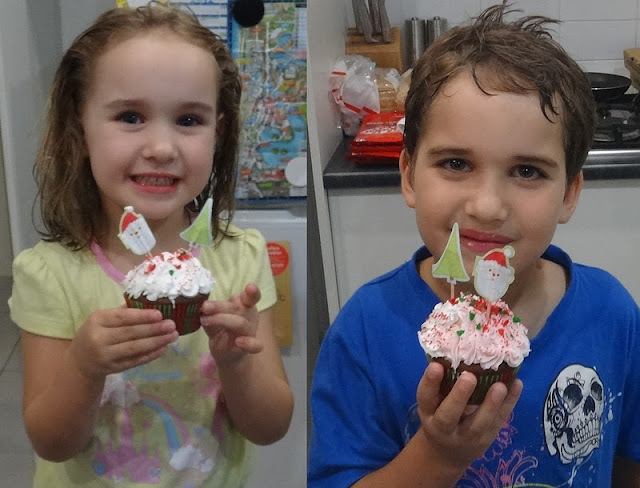 These really adorable santa and christmas tree cupcake picks were from Target for no more than $3! Glace cherries are so delicious and I had to incllude them somehow so I found the perfect place for them on top of the frosting on the candy cane design. I used a mixture of dark and milk chocolate to achieve the perfect balance of richness. Oh and you may notice in the photo below that the candy cane cupcake design has some little green sprinkles also, this is because I ended up adding some green sprinkles from my sprinkle rack! I hope you all have a lovely time baking yummy Christmas treats during this magical season!